I had been obese since I was a little girl. I wasn’t good at gym class, never played a sport and was always limited in my ability to participate in physical activities. I walked through the doors of CrossFit King of Prussia at 320-plus lb., having no confidence or experience using my body. Greg Glassman says, “We fail at the margins of our experience.” In my case, those margins were about as wide as they could be. When I started CrossFit, I was undoubtedly starting fitness from scratch. In a relatively short amount of time, I have made progress that probably did not seem possible—especially not to me. I have lost 100 lb. and gained many skills and personal records. I am one of CrossFit’s many success stories. However, this article is not about my success but rather what contributed to it. I share in the hope that trainers can help others like me reach their highest potential. My journey is my very own case study and serves as my base of reference, along with interviews I did with CrossFit King of Prussia’s lead coaching staff: Aimee Lyons, owner/head coach and HQ Seminar Staff member, as well as Jason Lyons and Nicole Sieller. Emily Beers convinces her mother to try CrossFit and experiences the trials and rewards of raising a new athlete. I’ll never forget the moment her CrossFit life was conceived. This is great. 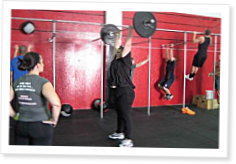 I go to Hammond Crossfit with Brad McKee as the head trainer and owner. Brad has been one of my biggest supporters. Brad Pattie and Brad help me with scaling and make sure I can do all of the WOD's. The Hammond box community has help me tremendously. I have been in Crossfit since the first week of March 2011 and have lost a 120 pound, and on track to loss 200 pounds in a year. Thanks Coach Glassman for Crossfit it is saving my life, and thanks Brad for the help and support you have given me. Great article! Thank you Stephanie. Great article. Inspiring story, you should be very proud. I found the discussion on scaling and muscle memory fascinating. I have not heard that idea voiced prior to this article. The trainers at your gym will be discussing your ideas on box jumps and pushups later today. Awesome article Stephanie! Thanks for sharing your story and shedding some light on scaling for coaches. This would be a great article for anyone in a box already or for those who think CF is too unsafe/crazy. Thanks again! I appreciat your article. Great job and keep up the good work. I know this will be extreemly helpfull to the whole Crossfit community. It was to me. I really appreciated this article! I've helped a lot of people lose a lot of weight... but I have no idea what it is like to go through that process. Your ability to achieve and share has really shed some light on the community. I know I took away some great ideas that I had not previously considered and I've been doing this a long time! Thank you so much and keep up the great work!!! Stephanie, if you're still reading comments on this article, I'd love to hear from you. I'm in the "unfit" category too, but not because of obesity. In fact, I'm small and thin. I'm pushing 60 and have never been strong. I have no athletic background and very little underlying muscle tone. I don't build muscle quickly. I'm also hyper-mobile and prone to tendonitis. In December I hurt my knee doing back squats at 58 lbs., which for me was a record. During the workout I felt good, and I was being observed by the coach so I know I was squatting correctly. Only when I got home did the pain set in. 8 months of CrossFit had not made my quads strong enough to support that much weight. I had to take time off and get physical therapy, which I'm still doing in February. There's no way I could have predicted that knee injury, or avoided it, because I didn't realize I was squatting too heavy. How do I develop fitness within the CrossFit context when CrossFit itself is what injured me? I've heard that injuries will happen and I should get used to them. Is that true? Is there a way, within the CrossFit model, to work with people like myself who don't respond as quickly to the model? Should I be looking for some other kind of exercise that's safer for people like me? Or working on developing more strength some other way, and then coming back to CrossFit? It's really a puzzle and something I have to resolve, because I'm not sure I belong in CrossFit, and yet I love it.